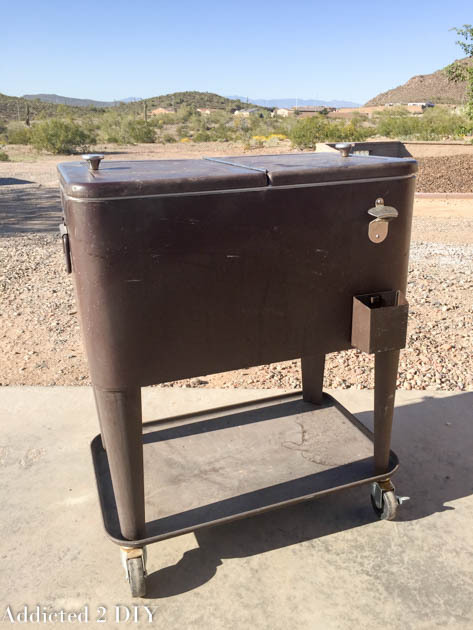 About a year and a half ago, our neighbors offered us this metal ice chest after they had gotten a new one. I instantly accepted and I had the idea of painting it, but it just never happened. It sat in our garage glaring at me every time I walked past it and I’m pretty sure my husband was glaring at me too, since it was another thing taking up space. 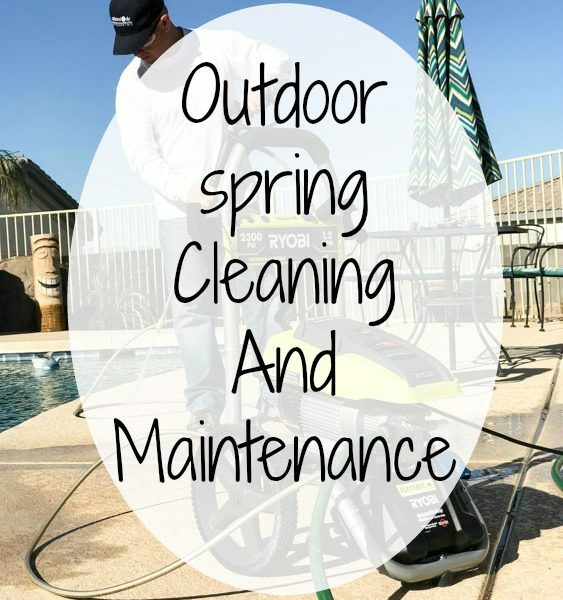 We don’t entertain much in the warmer months, but now that we have a new pool, I know that will change and it gave me the motivation to finally give this baby the makeover it deserved! Before I painted it, I hosed it down to get any dirt off of it. 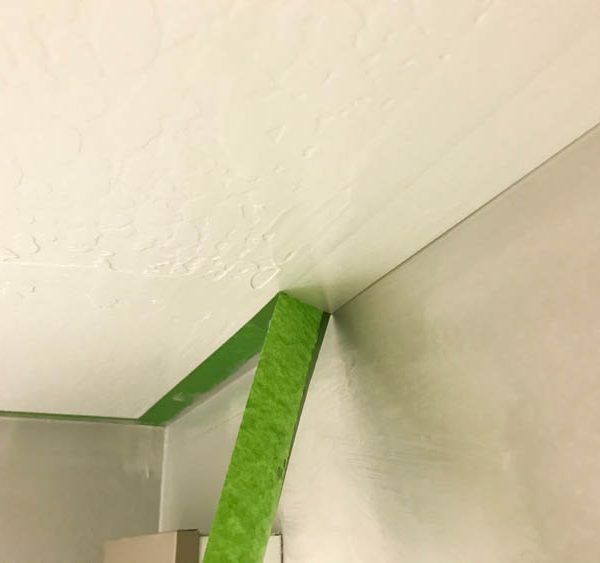 I took off everything I could, then covered everything else with painter’s tape. I covered the casters with pieces of aluminum foil since taping them off would have been quite the headache. 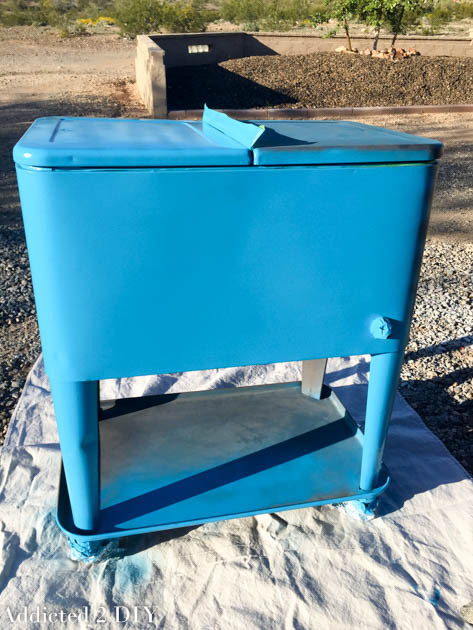 I chose Rustoleum Painter’s Touch 2x satin spray paint in oasis blue. It’s a fun, summery color and perfect next to the new pool! I used about 1 1/2 cans of spray paint. I probably could have used less if the wind weren’t blowing. Unfortunately, that is a constant problem when you live on top of a hill. Once it was painted, I let it dry overnight. 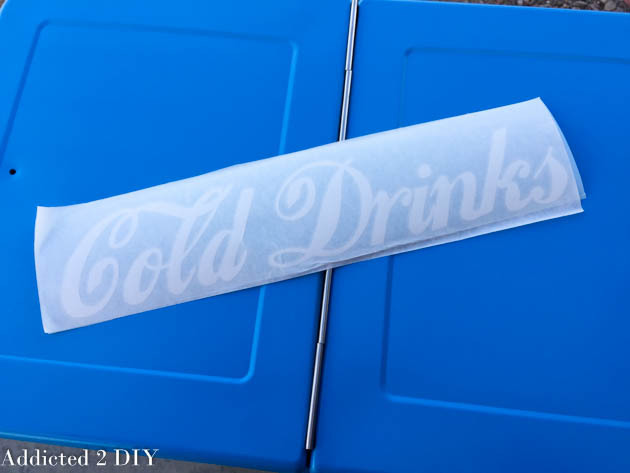 The ice chest has sort of a vintage feel to it with it being metal, so I wanted a vintage-looking font. 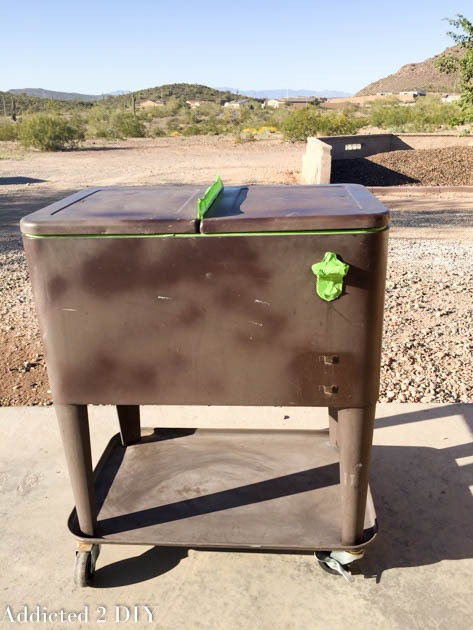 I chose Loki Cola from DaFont and cut it out of permanent vinyl and applied it to the front of the ice chest. 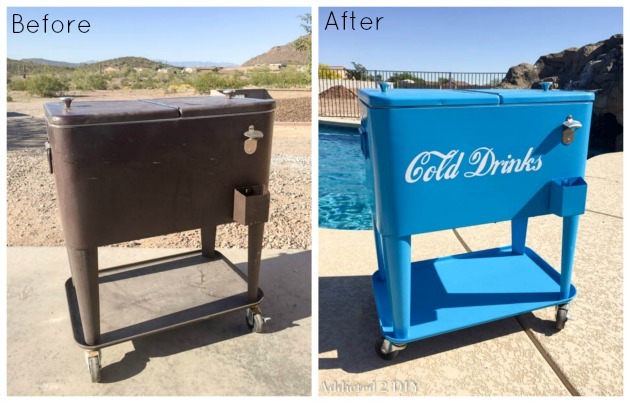 It’s hard to believe it’s the same ice chest! Even my neighbor couldn’t believe it, but he was so excited to see us give it a new life. 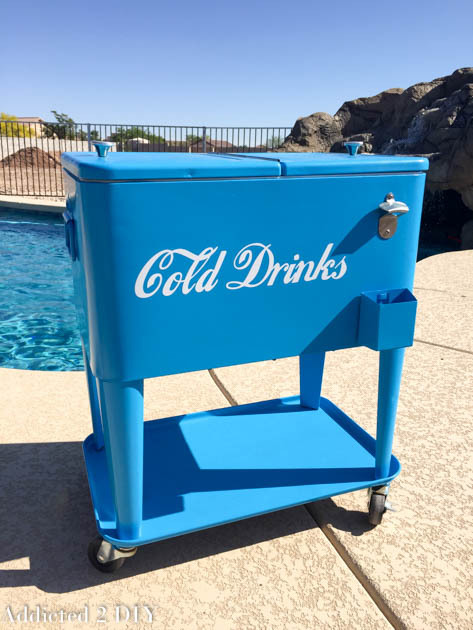 The ice chest was perfect for my youngest’s birthday party this past weekend and I know it will get TONS of use this summer! I can’t wait! 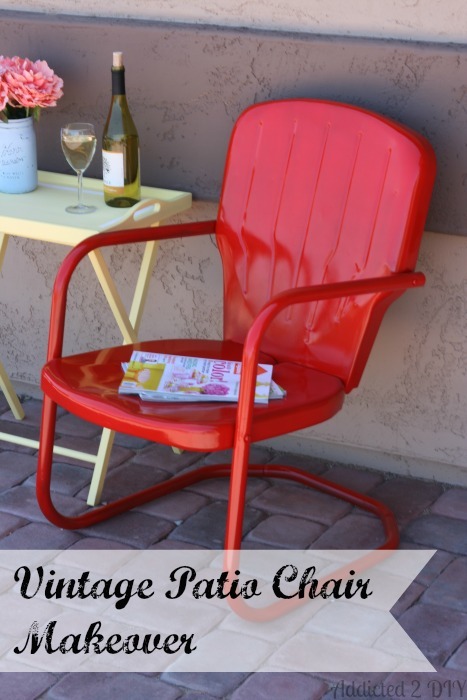 If you’re looking for a little more spray painting inspiration, you can see how I made over this vintage patio chair that belonged to my great grandparents. It’s been almost a year and it still looks amazing! You have done a great work! Congratulation for the result! WOW!! What an amazing score!! I have seen these chests (reproductions) at home décor shops and always wanted one… I wish I had a neighbour to hand one down to me… I will have to get out garage saling and keep my fingers crossed. It turned out incredibly, Katie!! Thank you so much, Krista! Yes, we definitely got lucky that this was just a hand-me-down! WOW that looks AMAZING…!!! Great job.. I wish I could get some freebee’s..!! Wow!! This looks amazing! The colour is perfect, especially next to your beautiful new blue pool. I have seen these ice chests in vintage stores and they are pretty expensive, so how lucky were you getting this one given to you? Mind you it’s your special touch that makes it look amazing! Angela recently posted…Spotlight on the Tuxedos instead of the dresses at The Oscars 2015! Wow Katie this is so cute. You did a great job. 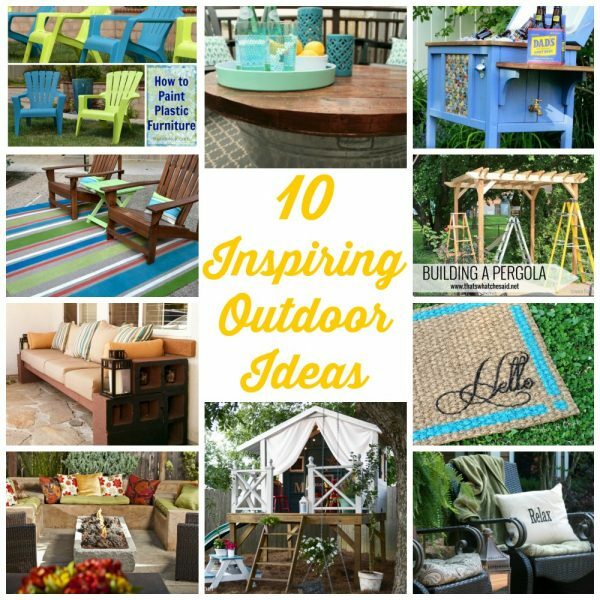 So fun when you can take something old and make it new and usable. Now it won’t make the Arizona summers so unbearable with cold brews next to the pool.